Top Class Executive Hire provide courteous knowledgeable chauffeurs in luxury long wheelbase Jaguars for wedding car hire, executive chauffeur hire and sightseeing tours around Inverness, Moray the Highlands and Skye. Top Class Wedding Car Hire provide special cars for your special day. Luxury Classic style Jaguar or modern Jaguar wedding cars for weddings in the Highlands, as well as birthdays and special occasions. For your wedding we can provide wedding car hire with your choice of ribbon colour, silk flowers and on the full wedding package a complimentary toast is provided for the bride and groom after the wedding ceremony. 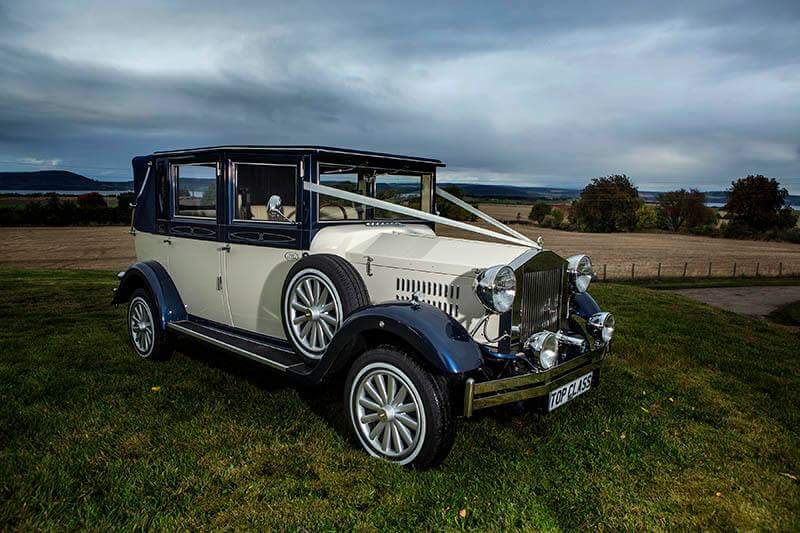 Our chauffeur and wedding cars serve: Inverness, Aberlour, Alness, Aviemore, Banff, Beauly, Brora, Cromarty, Dingwall, Dornoch, Elgin, Forres, Golspie, Huntly, Invergordon, Lossiemouth, Muir of Ord, Nairn, Portsoy, Rothes, Strathpeffer, Tain, and throughout the Highlands of Scotland, Morayshire, Perthshire and Aberdeenshire!